Strength, comfort, hope, remembrance ..... more than just jewelry. Wear this beautiful bracelet in honor, support or memory of those touched by Alzheimers. 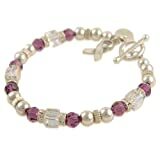 WD Designs' Signature Awareness Bracelet is a beautiful combination of SWAROVSKI ELEMENTS 6mm purple and clear along with .925 Sterling 6mm, silver accents and a sterling awareness ribbon charm. To determine your proper bracelet size, measure your wrist with a tape measure at the point where your wrist and hand meet. Now add 1"- 1¼" and this is your proper bracelet size.